Today, most of the jobs available in data analytics (DA) are for computer science graduates, but there are some companies that particularly look for electronics engineers. An engineering degree with a knack for programming, statistics and mathematics is the latest choice for employers hiring in the DA domain. Anand Sankaran, senior principal architect, Verizon Data Services, India informs that many universities in the US, Europe and India have started specialised courses both at graduate and undergraduate levels to cater to the increasing demand for DA professionals. Engineering graduates with a good knowledge of programming and business can have a well-defined career path in this sector. Harvard Business School predicts that there is a serious dearth of data scientists in the US alone. “With open data movements gathering steam across the world, scope for engineering graduates to make a career in data analytics is huge,” says Kaushank Nalin Khandwala, manager, Data Centre and Analytics Lab, IIM Bangalore. In the coming decade, social, mobile, analytics and cloud (SMAC) are the strategic focus areas for many technology companies. The entry-level roles in analytics are in the areas of data modelling, data visualisation, business analysis and reporting. Apart from their core field, engineers are now hired by IT companies, KPOs, captive analytics units and niche analytics organisations across various entry-level roles, such as management trainees, analysts and assistant managers in the risk, marketing and analytics consulting roles. Over the last 14 months, the spike in big data roles has also added to the mix. There are a lot of opportunities for fresh engineering graduates who have the right kind of skill set. The entry-level roles generally involve a profile where the graduates are required to aggregate, compile and screen the data and also prepare a datasheet for further analysis. In addition, they may also be asked to explore the data to find some insights before applying any data analysis technique. For engineers, roles will also be of programmers, specifically for Java, Python and R.
Freshers with good knowledge of Hadoop and cloud computing will have a distinct advantage. At PayScale.com, the average salary indicated for an entry-level data analyst is Rs. 257,383 per year. The skills that increase pay for this job the most are SAS, SPSS and quality improvement/QA. A mid-career data analyst earns an average salary of Rs. 400,236 per year. The highest paying skills associated with this job are database, SAS, Microsoft SQL server and SQL (refer charts). 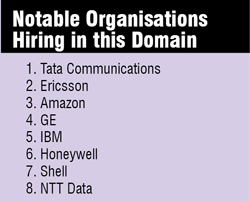 According to the data provided by TimesJobs.com, the top industries hiring DA professionals is the IT industry with about 42 per cent share of jobs followed by the manufacturing and engineering industry with a share of 10 per cent. Banking, financial services and insurance (BFSI) and ITES-BPO (information technology-enabled service-business process outsourcing) have 9 per cent and 4 per cent of the jobs, respectively (refer pie charts). Apart from Bangalore and Mumbai that feature in the list of top locations for jobs in the DA field with 25 per cent and 16 per cent, respectively, Delhi shares 19 per cent of the jobs and, Chennai and Hyderabad with 10 per cent of the jobs each. Remaining jobs are scattered in other locations (refer pie charts). Both freshers and experienced graduates should have a balanced mix of left brain and right brain skills, informs Anand. They need to be able to both count and connect the dots, be curious enough to question everything they see and sceptical enough not to accept every answer they hear, be both an analyst and an artist. With encouraging career prospects and amongst the most well-paid careers, DA jobs surely seem to be the next big thing for engineers to consider. It is already beginning to revamp businesses and their ability to compete by helping them make smarter decisions. 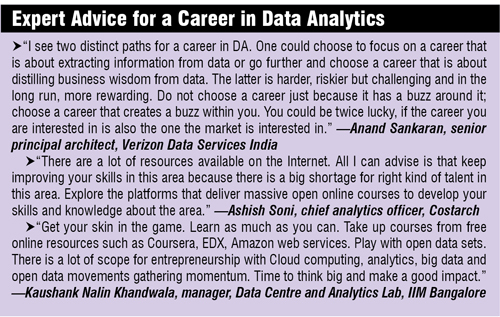 Analytics is the new career choice for those who want to stay ahead. Analytics is not too much into tools or technologies, it is a method of thinking that permits the use of knowledge, tools and technologies to extract valuable insights from data. Analytics jobs and careers exist in most large companies in almost every industry vertical.